At Kyu Saga Gosho Daikaku-ji Monzeki, boasting an everlasting history of 1,200 years, tasteful scenes of cherry blossoms in spring with as many as 3,000 lotuses coming into flower in summer, red leaves in autumn, and the snowy landscape in winter welcome visitors and worshippers. By using “Walking around the Temple Grounds” you can walk along Daikaku-ji’s corridors and experience its beauty. The ceremonial entrance, which was moved from the Kyoto Imperial Palace in the Edo period, is open only on special occasions. The entrance room is called Matsu-no-ma, which has a luxurious kinpekiga (painting on gold foil-pressed paper) of Matsu-ni-yamadori-no-zu with two large central pieces on the north front wall. An important cultural property with the architectural style of shinden-zukuri was presented by Emperor Go-Mizunoo in the Edo period. Tofuku-mon-in Masako, a daughter of Tokugawa Hidetada, who was the second shogun of the Tokugawa Dynasty, entered the imperial court and used it as a shinden (residence) of the Imperial Palace for the consort of the Emperor. 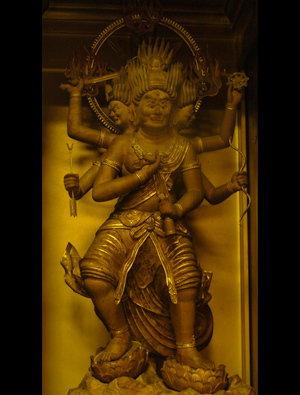 Uguisu-bari (nightingale floor) is applied to all the corridors and verandas. Chokushi-mon (the gate for the imperial messenger) is open only when the Emperor comes. 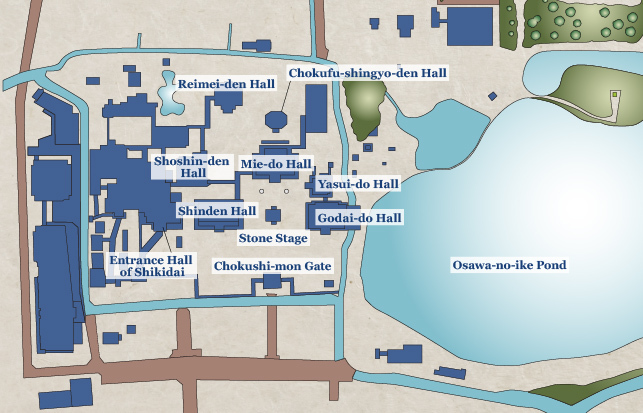 There is a stone stage remaining of the original Godai-do main hall and is currently used as a stage for the performance of gagaku and court dance and music, as well as fashion shows and concerts. Originally a banquet hall for the coronation of Emperor Taisho that was moved here in 1925 and renovated, the hall played a huge role in the history of Daikaku-ji. 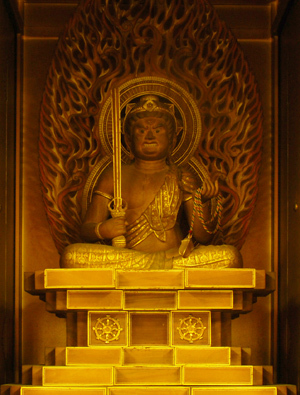 Mie-do enshrines the statues of Kobo-Daishi, Emperor Saga, Cloistered Emperor Go-Uda, and Gojaku the Prince among others. Mie-do Hall of Yasui Monzeki Renge Koin Temple was located near Higashiyama Yasui in Kyoto and then moved to Daikaku-ji during the Haibutsu-kishaku (movement to abolish Buddhism) in the Meiji period. The building originated in the mid-Edo period, and currently the grounds are the site of Yasui Konpira-gu Shrine. Yasui-do Hall has a life-sized figure of Emperor Go-Mizunoo at the front. Godai-do, the main hall of Daikaku-ji, was rebuilt in the late Edo period. 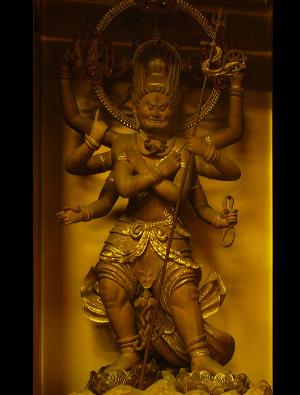 The hall has the statues of the Five Wisdom Kings including Fudo Myoo. It also functions as a sutra-transcription hall where a transcription session is held on the 1st, 11th, and 21st days of every month. Osawa-no-ike, the oldest artificial pond in Japan, has a diameter of about 1 km. One theory holds that the pond was created for moon viewing. At Daikaku-ji, you don’t look up at the moon, but instead tastefully look down at the reflection in Osawa-no-ike pond. There is the sutra (Hannya Shingyo) transcribed by Emperor Saga at Chokufu shingyo-den Hall, which is closed by imperial order (chokufu) and allowed to open only once every 60 years. The Murasame-no-roka corridor linking the buildings has low ceilings so that no one can swing swords or spears, and floor is uguisu-bari (nightingale floor) so that you will hear invaders. 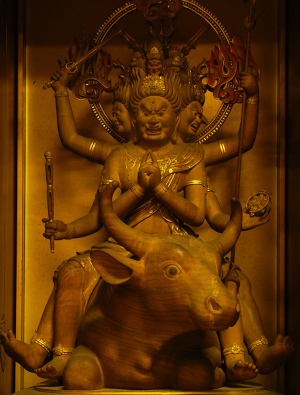 The main hall of Nichibutsuji Temple in Tokyo was moved and built as Reimei-den in 1958. 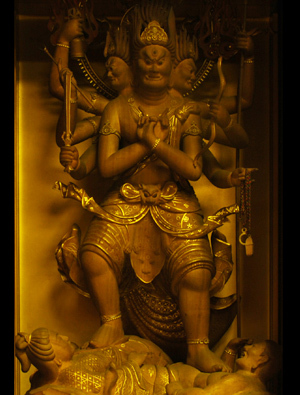 The temple enshrines the statue of Amida Nyorai as the principal image, as well as the spirit tablets of people who contributed to Daikaku-ji. The entire building is lacquered in vermilion to defy evil spirits. Designated as an important cultural property, the building has 12 rooms reflecting Momoyama period shoin architecture. During the period of the Southern and Northern Courts, precisely the time when Daikaku-ji was the base of the Southern Court, a peace conference between the courts was held here in Shosinden.